Whether it is swimming on the school swim team, filming a documentary in Costa Rica, taking part in STUCO, or just hanging out with her friends, Meghan Rice has made the most of what IHA has to offer. She is heavily involved with her local parish’s youth group and has served as a retreat leader. Meghan is also employed as a lifeguard and secretary. Reflecting on her IHA years, Meghan refers to junior year as her favorite time at IHA. She finally had the satisfaction of being an upperclassman with new responsibilities, junior rings, and junior prom. The excitement with the realization of who she was becoming overpowered the hecticness of SATs and college tours. She never met a communication class she didn’t love. Despite the challenging workload the classes entailed, the results were nothing short of amazing. 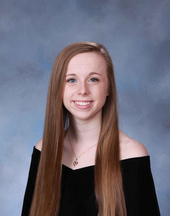 “These courses allowed me to take my interests in communications and advance them, and I couldn’t feel more prepared for college and a career in this field,” Meghan comments. She will mostly miss the faculty, her friends, and her kilt. “They have made my time at IHA something I will always treasure,” she says. Her best friend is someone who will be especially missed. They have been going to school together for 13 years and this will be the first time they will not be at the same school, but Meghan is comforted with the fact that they will only be a phone call apart. We wish her the best of luck to her, and IHA knows she will succeed in anything she does! Categories: News@the Heart, Senior Spotlights! !